Having rediscovered this blog in recent weeks I realised I left things on a bit of a downer after the Silverstone Half, which isn’t really a fair reflection of how the last few years’ Challenges have gone. As today is the start of a New Year (and I have a few spare hours to fill) I thought it was only right to round-up how the rest of 2017 went – the best of the best if you will – and for anyone still reading to give a bit of an insight into what is to come in 2018. The two main reasons I started this blog in the first place were firstly to help get fitter and achieve some personal success in races, and secondly to raise some money for charity from sponsors in my long distance challenges, so when a friend from the gym announced he would not only be organising a fun run on behalf of a local refugee charity, but it would be in my local park (my first race ever on home turf) it was a no-brainer. At just 3km I would of course have to break my own ‘not-getting-out-of-bed-for-less-than-5km’ rule, but on the basis I could add a couple of km each way by running to and from the race it made it more worthwhile. A few seconds into what was a rainy run, I realised I had slightly misjudged the level of competition, as I sprinted off the line leaving behind a crowd comprised mainly of children and pensioners! Still, a result is a result, and I realised I had a rare chance of a podium as this rate. In the end it did not quite happen, and I had to settle for 5th place behind a kid about a third of my age (if only the race had been longer distance!) whilst top spot was apparently taken by a Team GB quadrathlete who had also obviously not got the memo about taking it slowly. Still, a fun day out, and maybe one I can return to try again in future. This one goes right back to the early weeks of January almost a full 12 months ago now. Just a nice early morning run around the East End, but with a pretty memorable centrepiece running around Olympic Park and the Stadium. Despite being pretty chilly, the lights looked great – except for the pitch black ‘Greenway’ section which my workmates casually told me was also known as ‘murder mile’ later that morning – but fortunately there were not too many others about at 6am and it ended up being just me and the stadium for much of the run. As our fourth One Live in two years, we felt like veterans by the time this rolled around in July, longer getting lost on the way to the venue or between classes, and managing to pace ourselves to not burn out around lunchtime. I have written loads on here before about One Live, and happy to say this one was more of the same, which was a good thing. We hit all the big classes – Combat, Attack, Pump & Step – bookended with some relaxing Body Balance and a bit of Sh’bam fun. This was a big year for City runs, and at one point had intended to try a different one each month – until I changed jobs and stopped living in hotels like Alan Partridge for a living – but I did manage to get in a good few in the first half of the year. Talking about living in cheap hotels, I had two weeks in Norwich during the late-June heatwave, which gave some good opportunities for exploring, although the runs needed to be either first thing in the morning or late at night to avoid the most of the heat. It is a great running city with interesting streets, a castle, football stadium and plenty of riverside paths to explore / get lost in. The second week was spent out of town in a much nicer resort with its own golf course, which naturally I had to test out on another early morning run, trying to avoid the groundsmen in their giant lawnmowers who I had convinced myself would tell me off if I went near them for running near the course. An even more exotic destination back in March was a fortnight on the Channel Island of Guernsey, which was also surprisingly warm for the time of year. Saint Peter Port is a charming capital of sorts, and another fantastic location for some long runs around the water’s edge. Highlights included fantastic early morning sunrises over the sea, two large castles with plenty of cannons, and generally great scenery all round. Whilst two weeks in Cyprus was not great for running (just descending the steps to the pool made you sweat in 40 degree heat) it was a lot better for diving, after I discovered a great scuba centre right next door to my hotel. After a couple of familiarisation shore dives I managed to notch up my 50th dive (as well as achieving Master Scuba Diver status) on none other than the Zenobia – rated as the top wreck dive in Europe. With warm waters and great visibility, the near-fully intact transport ship more than lived up to expectations as we managed to swim all around and inside the vessel, joined by copious amounts of tropical fish. A couple more sessions closer to our resort culminated in my first ever night dive, which ended up turning into more of an underwater rave complete with glowsticks! Going back even further to February I had a freezing fortnight on the Toon, staying so close to the Tyne that the fog was literally all mine, misting up my hotel room window every morning. The runs though were great, and I wrote about them on here in some detail in a previous post. As usual I alternated between late evening and early morning runs, meaning I had most of the streets to myself, got totally lost (at one point missing my lift to the office after an unintentional extra 30 minute detour one morning!). Still, the parks, bridges and waterfront all looked great lit up and this was a nice way to see much of a genuinely interesting city. My first event of 2017, and covered in much detail in my last post. Looking back I am still glad I managed this, the opportunity to emulate my F1 heroes and zoom around the famous circuit, albeit with eerily empty stands! If anything it made sure I got the year off to a start, making me train though winter and teaching me some valuable lessons on pacing yourself in a race. Ok this one is not strictly a sports event, but I was fortunate enough to spend this Christmas in Iceland, which I would be remiss not to talk about here. Whilst the snow made it pretty impractical to do any running, we did manage to conquer a few snowy peaks on top of the county’s longest glacier Langjökull, and even venture inside at one point (wearing crampons to ensure no ice-related injuries). A fascinating and beautiful country, especially at this time of year, which I would highly recommend to anyone interested in the outdoors. Back to the running world, I did manage a warmer run in April whilst spending a few days in city of Valencia in Spain. Given the weather allows for great year-round running the locals have done a fantastic job of creating interesting run routes, most notably the Turia gardens, a dried river bed that once ran through the city, which is now acres of parkland which winds around the historic old town, past the city gates and the out-of-this-world City of Arts & Sciences which has to be seen to be believed! Last year seemed to be a case of either being far too hot (Cyprus, Valencia, er Norwich) or freezing cold (Iceland, Newcastle, London in January), but I did manage to get in one more hot run in London whilst working there in early July. Although I stayed in my usual place and retraced a few of my classic routes, this one was a bit special as it was my first proper ‘Virtual’ race – the Top Gun run. The idea with this was I could complete any route I liked, in any time, and upload to a website to ‘compete’ against others. I received back a finishers certificate and a pretty cool Top Gun medal, which if anything is at least the largest one I now own, if not the best looking. My other proper half marathon last year was in Worcester, near to where I live. This ended up going a lot more smoothly than the Silverstone race, although was perhaps slightly less memorable. Closed roads made it a lot friendlier, and it did have a good atmosphere with plenty of time to chat to other runners as we completed one large loop, and learning from past experience I relaxed properly into this one, giving me a slower finish time but plenty of opportunity to take in some of the countryside in spring. The last of the non-run events this year was also arguably my A-Race, a 100 mile bike sportive around the West Midlands, taking in parts of Birmingham, Staffordshire and Worcestershire. In the past I could have written pages about the great atmosphere, hair-raising corners, organised pit-stops and even attempted sabotage from local protesters (yes really! ), but the main thing I remember from it was hills.. endless hills. As much as I had tried to train properly for this race I had other things on my mind (see next entry) and as such I had enough stamina to get around this, but it took over 8 hours (!) and was a real killer. That said, it was a huge achievement which I would stand alongside any of my half-Ironmen on time alone, and the less said about recovery time after an entire day in the saddle the better! So the biggie, a full marathon in my adopted home city. And what a day is was! Having completed plenty of half’s over the years, I decided it was time to step up ad bite the bullet. The good news was there was a new route which started the race in the main athletic stadium in the North of the city, before winding through to the centre. From there it turned into two loops, some of which was on the old half marathon course, although interestingly doing it backwards (clockwise rather than anticlockwise, not actually backwards as that would be crazy). This had some benefits as it meant I knew where I was going (although with 10k+ runners it would have been hard to get lost), but as per the usual rules of multi-loop races meant the second lap was guaranteed to be a real test of mental toughness. And with some inevitability, around mile 20 a particularly short but steep hill brought on a dose of cramp and put paid to any thoughts I had been harbouring of a sub-5 hour finish. In the past I might have let that get to me, but this year I had learned from my mistakes in Silverstone, and refused to let myself worry about times – after all this was my first ever full marathon, and was taking place around the corner from where I used to live, and right next to my current office – this was too good a chance to worry about small things. So with the help of some of the best support for any race I have ever taken part in I pushed through the final few miles and made it across the line for that indescribable feeling of euphoria you only get after going through the limit. Marathon complete! So how could that list possibly be topped? What next for 2018? Well a few days ago I realised that this was looking like the first year in half a decade where I had no races in the diary, having had to enter most of my big triathlons and marathons over 12 months ahead in some cases just to be sure of a place. In something of a panic I have managed to spend New Year booking myself onto two big outdoor events:Wolf Run & Tough Mudder. 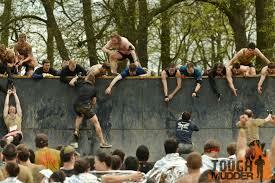 These are both off-road, trail based runs which should involve plenty of rough terrain, obstacles, and of course mud. Both should be fun, and I am sure I will be adding a few more races to the list by the end of the summer, and who knows maybe I will be able to rack up as many events as 2017. I might even write a blog about them…! First race of the season, done. That pretty much sums up last weekend, and an event that may well turn out to be less memorable in the long-term than I had expected, although it has taught me a few lessons which I am sure are going to be useful later on this year. But before I go into those, a few words on how my early season half marathon went down. I have always been a fair weather athlete, and until now every race I have taken part in since getting into multi-sports in around 2010 has been during British Summer Time, between April and October. And for good reason, as we Brits don’t usually get the best weather even during our supposed warm season, but believe me it can be even worse in the winter, which makes training a real pain. This has never been a problem, as my A-Race has always been from around June onwards, so I have got away with indoor training until the end of March, and then topped things off with a bit of outdoor swimming and running in the sunshine, ready to hit my peak as the weather finally improves. Silverstone is probably the most famous racing track in the UK, and as an F1 fan it always feels a bit special. I had been lucky enough to go a few times before, although both times were to see my wife and brother on track day experiences rather than for major events. 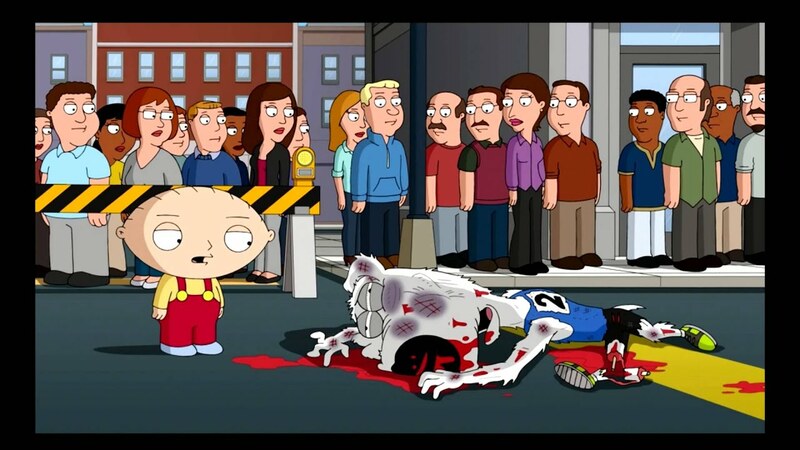 All the more reason to look forward to running on the hallowed tarmac. The first thing I want to say is that the organisation and logistics of this event were absolutely fantastic, possibly the best I have ever encountered. Signposts & parking were clear & easy, and there were an absolute ton of really friendly marshals to help out and make sure everything went smoothly. In fact I am willing to bet there were more race attendants here than there will be competitors in the next race I am booked on for in May. Great work fellas! Sadly the weather was not playing ball, as despite the Saturday before (and Monday after) being sun-filled delights, it was raining just enough to be annoying and cold, but not quite to the degree of requiring an actual raincoat. The event plan asked competitors to be there by 10.30 am for the 12.00 start, which was sensible to avoid a last minute rush, but unfortunately meant 90 minutes of standing around getting cold before things kicked off. After leaving my stuff at the bag drop I headed to the line at 11.15, assuming there would be some sort of pre-race briefing or warm up, but again, nada. Just 45 minutes of jogging on the spot (this time minus my warm outer layers) and casually trying to shelter from the rain behind a taller person without letting on what I was doing. The event plan had said there would be various bands playing throughout the course, but every time I took off my headphones to see what was going on they just seemed to be playing Bon Jovi on the speakers. Not that there is anything wrong with that by the way, but I did prefer my own mix (which included plenty of other 80’s classics). Apparently the starting band was Scouting For Girls, who had a few horrendous songs about a decade ago, which was all the more reason to keep my buds in! As with most races this big, the start was a bit of an anti-climax, as instead of sprinting off at the sound of the klaxon, we spent a few minutes doing the awkward British shuffle towards the line, as about 5,000 people tried to squeeze between the starting posts, but finally we were off. It was a strange feeling running on the track, a bit like being in the middle of a nice wide road, but with a surprising amount of water retained in places. The corners were also a lot sharper than expected given drivers must regularly be doing over 100 mph in places! I set off at an absolute blast by my standards, in my head really going for that 2 hour mark. My plan was basically to keep an eye on the pace screen on my Tom Tom, and keep it below 6 minutes per kilometre, which would see me through on time. And things were going great as I was going closer to 5.30/km or bang on 9 minute miles in old money, and managing to maintain it well. I hit the first kilometre in 5.15, and the 5 km mark in 27 minutes, not far off my top speed for that distance. Perhaps that should have been a warning, but I was too focused to worry for now. Around the 30 minute mark I saw multiple Olympic gold winner David Weir zooming past on what must have been his last lap in the outside lane (he won the race in 47 minutes! ), which was pretty motivating even if it was only for a few seconds. He was miles ahead of the rest of the field, and even the camera car following him seemed to be struggling to keep up. As much as I would like to say it was fun running on such hallowed racing ground, the actual experience was a bit less so. The British Grand Prix has around 150,000 spectators meaning the stands and banks get packed out, and everywhere the cameras go on TV there are thousands of cheering fans. Understandably the turnout for this race was a bit lower, with probably a few thousand family members congregated mainly near the start finish line, meaning that for 90% of the race the atmosphere was a bit quiet in such a huge venue. And if the outlying stands looked a bit empty from the front, they looked positively skeletal backed by the grey sky as you ran behind them, taking a bit of the sheen off things. About halfway through the sun finally broke through and it warmed up, which means the weather was basically doing the exact opposite of ideal conditions for a race, i.e. warm beforehand whilst you stand around on the line, and then a bit of light rain to cool you down towards the end. Instead, it meant even more of the clichéd runners ‘throwing-water-on-your-head-to-cool-down’ tricks at the pit stops. At 15 km things were still going alright, as I reached the three quarter mark in under 90 minutes, but I began to notice the route starting to head uphill. And from there it did not really let off for the rest of the distance. When you watch racing on TV the course always looks so flat, and the cars are so powerful they barely seem to acknowledge and gradient. But on foot it is a lot more up and down than expected, and I later found out that whilst more of the first half of the course is downhill (perhaps explaining my pace), the second half has more uphill. Not steep mind you, like the Great Birmingham hill, but just enough to take it out of tired legs. It was about that point that I started to struggle, the combination of heat, hills and hunger hitting my body like a rugby tackle and chopping my pace. Suddenly my target of just 6 minute kilometres seemed a long way off, and as it began to creep up over 7 minutes it hit me that the dream was over for today. That realisation and disappointment only seemed to make things worse, as my body began to give in. I was, as they say, hitting the wall. 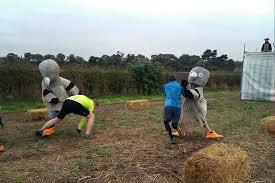 In triathlons this is known as ‘Bonking’, apparently due to a lack of glycogen in the body. It has famously happened to both Alistair & Jonny Brownlee in recently years (so I guess I am amongst esteemed company), although I did not have anyone around willing to carry me over the line, so I just had to push on as much as possible. After pinning so much on hitting my target I was genuinely gutted as it shattered before my eyes, and had I been more hydrated might even have shed a tear or two, but I was not going to let the race beat me. My pace by now was verging on walking, although I refused to actually go there, managing to get along with the classic runner’s shuffle up the final few slopes as waves of others that I had been overtaking in the last couple of hours began to flow back past me. Finally though, the finish was in sight, and although I could not quite manage my ‘trademark’ speed burst for the line, I did manage to get together for the last few hundred metres to the end. Finally, there were some supporters lined up cheering us on, although sadly no chequered flag to wave us over the line, possibly for the best as I might have run straight into it! The first thing I remember after I crossed the line was the pa system playing that horrendous Disney song ‘Let It Go’, probably the most inappropriate racing tune imaginable, although I did have a feeling maybe it was aimed directly at me, to tell me to get over the time and just enjoy the finish feeling. Sadly I was in too much pain, so hobbled over to collect my finishers pack [incidentally – best goodie bag ever, with a quality medal, t-shirt, a ton of food and even a bottle of sunscreen] and downing the protein shake it contained in a single gulp. Now I have had a couple of days to reflect on things, and also read back what I wrote straight after, I have realised I may have been a bit of a drama queen about it. After all, in none of the 20 or so long distances events I have raced in the past have I ever been remotely bothered about my time (other than when I just made the 8 hour cut off by 3 minutes in the Avenger), and I had not done any specific speed training. Maybe this was my best chance to break two hours, or maybe it will come next time. I also read an interview with David Weir online where he said how tough he found the conditions tough, and also did not beat his own PB either, which made me feel a teensy bit better. It was pretty cool seeing him zoom past, and had I had the energy I would love to have given him a Weirwolf howl (awoo)! So the main takeaway here is the first race of the season is done, and I survived. Plus I have a head start on training this year, as well as some valuable lessons on both myself and racing that I plan to put to good use in future, and might even talk about next time on here. Plus a great excuse to dig into some of these bad boys that I realised I had stashed away for a rainy day in the house! I realised the other day that I have not written anything on here all year, and wondered whether it could be due to something I talked about a while ago, where the bulk of my winter training has been based on indoor classes. As much as I love doing them, the thing is you really don’t get much time to think, as you focus on following the instructor in time to music, and in my case make sure you don’t fall over! With longer distance training however, you have a lot more time to yourself and your own thoughts which, for me at least, is where I end up writing most of these. But that is all about to change, as not only do I have something to talk about now, with my opening race of the season just a few days away, but I have managed to man-up and get out in the cold for a few decent runs recently. To be fair, things actually started a few weeks before Christmas when I was working down in Gatwick and managed to get in a few evening runs, which I wrote about in my last blog. Given that my job involves travelling around the UK and spending a fair bit of time in cities – some more interesting than others – I thought I would make more of an effort to do some exploring on foot and then write about the places I get to along the way. First up for me this year was of course London, a place where I have to spend a lot of time, usually around the Docklands area. Whilst I have been for plenty of runs around the river and into Canary Wharf, it is not always the most exciting part of town, so rather than glamorous sights such as the Houses of Parliament and Tower of London, it tends to be the Flats of mid-week Commuters and Tower of HSBC. But this time I had something different planned, in that I had never been close to the 2012 Olympic Stadium, which is located in Stratford (not the Shakespeare one), a do-able distance from where I was staying. Knowing I would need a fair bit of time to get it done before work, I bit the bullet and set my alarm for a Rocky-esque 5.45 am. By 6 I was on the road, and heading towards Canning Town high street, and having recently watched a documentary with Idris Elba talking about the fights he used to get into there, I was pretty glad I was going to be the only one about at that time. But I wasn’t, and whilst there was definitely no sign of trouble, I was amazed at how many people were up and about at that time in London, walking, bussing, DLR-ing and all sorts. I am pretty sure where I live it is a ghost town before 7! Following the rough map I had in my head from my research the night before, I carried on and tried to follow the signs for Stratford, although being designed more for drivers than runners, I had to ignore a lot when they tried to steer me back to the main road. Once I reached West Ham station I climbed up and onto Greenway, a well-lit footpath which looked like it would take me all the way to the stadium. Once I got to the other side my target was firmly in my sights, and aside from having to zig-zag along a ridiculous road layout to get there, I finally reached the famous Olympic Park. I decided to run a Mo Farah style victory lap around the stadium, which sadly is now leased by West Ham United so full of their branding, but it did feel great and a decent reward for getting up at that time. Reaching the start I saw a few other laggards had dragged themselves out of bed too and were just reaching it, but by that time I was back on my way. Ok, I did also look into jumping the fence to get onto the adjacent running track for a quick lap around that too, but it was getting just that bit too light so I chickened out! Having taken part in plenty of straight line out and back races where the return holds no excitement, I always try to find a different way in my runs, so veered towards the city centre and tried to find a new route, which whilst slightly less exciting (that damn main road the signs were trying to take me to earlier) was also less eventful, and given I was starting to tire by then was probably for the best. All in this was a 15.15 km run in 1 hour 40, not particularly fast by any standards, but given that firstly I had forgotten my water bottle (fortunately I had a single gel in my back pocket) and stop-started a load of times to take photos and get lost, was not too shabby and hopefully a good sign for my upcoming half-marathons. My next trip was up to the far north of England, the city of Newcastle-upon-Tyne, home of Alan Shearer, the Angel of the North and of course Ant & Dec. It was a place I had never visited before given it is a fair way away, but I had always fancied it given a great running heritage thanks to the Great North Run, the World’s largest half-marathon. Whilst I did not quite have the time or inclination for a run of that distance, I did manage to get in three pretty decent efforts during my fortnight there. First up was my explorer run, another early morning job (this time a lot quieter as I had expected before), where I made my way around the city centre at leisure, scoping out the Quayside, Chinatown, St James’ Park football ground and a few nice enough parks. Despite getting a bit lost towards the end and doing a couple of km longer than planned (the city is a labyrinth in parts) things turned out well, and I got to see a good proportion of the local sights as the sun gradually rose. The next afternoon I tried a different tack, running alongside the north side of the river. Initially I headed East and towards South Shields, the finishing point for the GNR and more importantly into Byker (the Grove!) but it turned out not to be particularly well lit, so after a mile or so I turned back and tried the other way inland. This was a lot busier – there seems to be tons of running clubs up there, all going off around 6 pm – but again there was not a huge amount to see. A nice peaceful run is all well and good, but given the short time I was there I fancied seeing a bit more, so I turned it into a bridge run, covering the four major bridges across the Tyne in turn: The Millennium Bridge with its spectacular lights, the High Level Bridge for some spectacular views, the low-level Swing Bridge, and to finish things off the famous Tyne Bridge itself. Amazingly it turned out when I got back that my run was almost identical to the one the morning before, which was not bad given how often I was stopping to take pictures and check my GPS! The following week I though I would try something a bit different and keep on the Gateshead, southern side of the river where I was staying. The plan here was to make a parallel run up the river but turn off after a couple of miles to run past the office I had been working in. Although the first section was well lit, things got a bit dodgier after a mile or so after I turned off and headed away from the river. Going back to earlier, part of the reason I prefer early morning runs is because you tend to have places to yourself. Now with all respect to Geordies who are some of the nicest people I have ever met, Newcastle is somewhere which has a reputation for being a tough place (especially amongst soft southerners), and the further away from the main track I ran the more I imagined meeting a group of ne’er-do-wells. After deciding against running down the deserted canal path on my own, I skirted the main road instead, and after one particularly bad stretch where all I could imagine was meeting David Patrick Kelly’s character from the end of The Warriors, I rounded a corner and found the office. I can honestly say I have never been so glad to find an industrial park in my life. That just left me with getting home, which was equally challenging, as the bus route I knew involved a massive hill, and for some reason I was desperate to find a park I had read about which looked like it had some sort of Disney castle (no joke, google it) which involved a bit of a detour. So another couple of miles later I found myself at Saltwell Park and immediately regretted it, as it was pitch black and all the entrances were padlocked. Probably for the best as all I could think about was that it looked more like the kind of abandoned amusement park Scooby Doo would hang out in than Fantasia. Still, the one benefit of my ‘shortcut’ was that it would all be downhill from there, and a good thing too as by the time I finished I was over 14 km, well over what I had originally planned to do, and whilst it was a long way from The Shining (probably closer to the Jeremy Kyle graffiti above…) this run it did teach me a bit of a lesson about planning my routes a bit more in future. Despite all that, I have to say Newcastle is an amazing place, and I am looking forward to going back there some time (ideally in the summer as it really is cold!) for another round of city running. But in the meantime it is tapering time, as this weekend is time for my first proper race of the year, the Silverstone Half Marathon. More on that next time! It was about 24 hours before this year’s Great Birmingham Run that I started to think I should probably have done some more running. In fact, despite having already done one half-marathon back in July (courtesy of the Isoman Triathlon) I have barely run at all this year, with at best half a dozen sessions of 10 km or longer. Don’t get me wrong, I had no worries about finishing the race as I feel fitter now than at any point in my life, including when I was playing regular rugby at 18. But as I have made clear a few times on here, running is my least favourite discipline of the Swim/Bike/Run trinity, and in general I will always look for alternative training sessions. This was particularly relevant in the build up to this race, as for a start it was not part of my plans at the beginning of the year. Having previously done the race twice in 2013 & 2014, I gave it a miss last year due to the fact I had wanted to focus on Ironman, and also that because of major roadworks in Birmingham centre the course was going to be changing. I had expected to leave it out again this year, but then something came up which changed all that, which I will come back to later. So anyway, rather than signing up nice and early and planning ahead, I did not get around to entering until September, giving me a fairly narrow window to train. As I mentioned finishing was not a concern, given it would be my sixth half, three of which as part of long distance triathlons, so knowing my legs would finish up in one piece before the start gave me some advantage. The problem was more the two races before, where I had clocked in times of 2.12 and 2.08 respectively, and being a competitive blogger I knew it would be shameful to come in slower, and thus had to ensure I beat my previous times to achieve something worthwhile. No pressure then. The other problem was that rather than go by the book / training plan, with 3 or 4 nice runs per week (including a long one on Sunday) blah blah, I just did my normal training – Body Combat, Attack, RPM and so on. This at least ensured my fitness stayed high, but probably did not get my legs into the shape they should have been. To make things worse / better (depending how you look at it) two weeks before the race I had a Les Mills Live day in Manchester. I won’t go into huge detail here, as it was fairly similar to last year (https://chilechallenge.wordpress.com/2015/11/20/one-live-manchester/) but safe to say it was another fantastic day involving 6 different classes, 5 hours of training, and nearly 4,000 calories blitzed. Ouch & yes! But probably not for my legs, as it took most of the rest of that week to recover. What about the weekend one week before the race I hear you ask? Well, that was of course the time my gym decided to launch the new quarterly Les Mills releases themselves, necessitating another morning of 3 back-to-back Combat, Pump and Attack classes (in Halloween fancy dress natch!) and another few days of Doms in my legs. 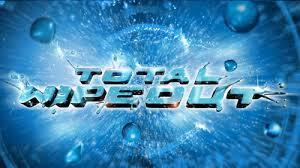 Mid-week tapering with 4 days to go? How about getting asked to play football for your work team in your bi-annual 5-aside tournament in Leicester, with guaranteed ice-hockey style tackles on the pitch and ideal-training-food-curry afterwards. Yep, that happened too. … so it was with some irony that I woke up on Sunday to the sound of a monsoon outside, as the rain decided to lash it down with the remains of some storm or other doing its rounds through the Midlands. The best laid plans, eh? But I had a new plan, stealing an idea I had found on the race information website. So quite what any observers would have made of me an hour or so later, crouching in the front seat of my car in an underground parking lot, trying to wriggle into my race shorts and rubbing Vaseline into my chest to avoid chafing, I will never know, but I think the fact that none of the bypassers batted an eyelid must speak volumes about what goes on in Birmingham car parks. 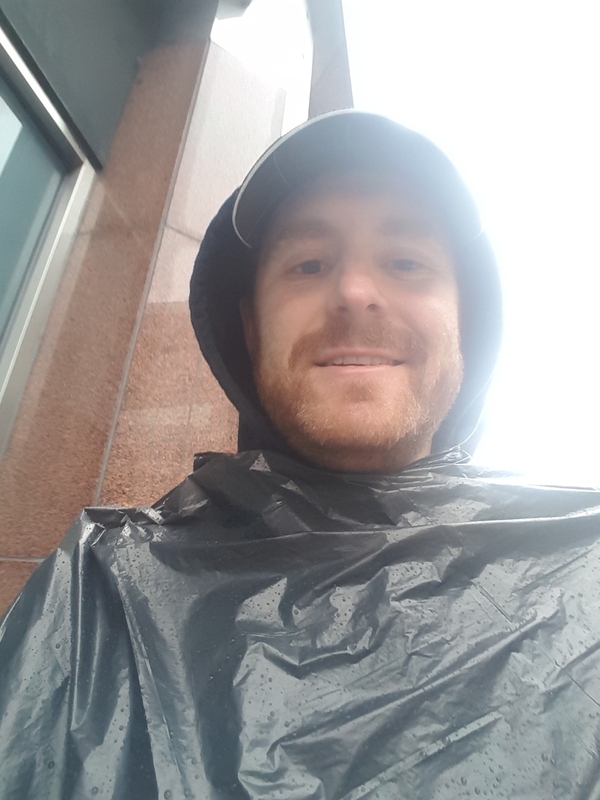 If that did not get them, the sight of me stepping out wearing a full black bin bag and striding down Broad Street to shelter from the rain, looking like a cross between Clint Eastwood and Derek Zoolander doing Derelicte in my homemade poncho. Regardless, it did the job, and by the time I reached the new start line – which was some 4 km from where I had parked (20% of the race distance!) – I was still reasonably dry. At that point, having survived the monsoon and with a forecast of more to come, if a someone had offered me a bet that it would end up nice weather for the race I would have laughed in their face. But they would have been right, as inconceivably, just as we got to the starting area for the group warm up, the sun came out and it started to warm up. Throwing off my old tracksuit (another tip I picked up this year: if I ever spot someone on one of the Birmingham underpasses in a knock-off Rugby World Cup top I will feel I have done my bit!) I lined up in the holding pen alongside 20,000 others and waited for one of my heroes, Commonwealth Gold Medallist and local triathlete Jodie Stimpson to kick us off. It does not get more Birmingham than the Bullring! As those who have entered big runs like this before will know, the start can be a bit of an anti-climax, with everyone pumped up & ready, a massive klaxon going off, and then rather than the mass brawl you get in say a triathlon swim, you have a 5 or 10 minute wait whilst you are shuffle down a funnel of barriers towards the line (in a typically polite British fashion of course) before eventually getting to the front, looking down to make sure you start your GPS watch the moment you cross, and actually getting going! Despite this, for the first half of the race, I really was motoring (by my standards anyway). My first kilometre was over in a shade over 5 minutes, and the first 5 kms were 27.11, not far off my best Parkrun time. I even managed to fly up the first mini hill as you veer off the main road just after the 6 km mark (the little kink on the map) which I remember absolutely killing me the first time I did this race, and certainly having to walk a bit the second time around, but this time around I barely slowed and could enjoy the immediate downhill on the other side. The route through the halfway was much the same, as I focused on keeping my pace below 6 min/km on my TomTom, with a view to trying to achieve a magic 2 hour Finnish. Things were looking up as I hit the 10 km mark at 55.29, another fantastic time for me, well ahead of what I would normally do in training. 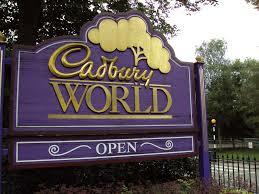 Perhaps I should have known then it would be too good to be true, but I used it to keep my legs pumping as I looped around Cadbury World and started retracing my steps down Pershore Road. It is worth mentioning at this point the support you get in this race, which is absolutely fantastic and part of the reason I am happy to do it again and again. This is a road race, and other than a small section early on where you run around some of the less salubrious areas and warehouses of Birmingham, you are going right past people’s houses, sometimes just yards from their front doors (meaning it must be a strange experience for those who fancied a lie in that Sunday). Obviously a bit of good weather helps, but the fact is literally thousands of people turn up to watch, many giving out sweets or drinks to help us crazy runners, and most of the kids offering hi-fives for a bit of extra pace, which I can never turn down. 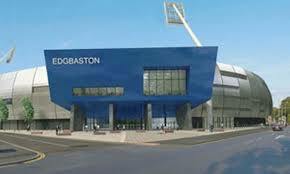 The next part was the only new addition to the race this year, a bonus loop around Edgbaston Cricket Ground, location of my first temp job after finishing uni. This time however I was not serving drinks, and Freddy Flintoff was not smashing a mighty 167 runs, as there was obviously no match on. Now I am sure this sounded a very good idea on paper, but I have to be honest in that the rear section of an empty sports stadium is not actually the prettiest part, so as I ran past the empty bars and bare concrete walls I had to rely on my memory to think about the lovely green pitch and the roar of the crowd. Still, at that point I managed to pass a guy running in full firefighter gear & O2 cylinder (a real one) and Mr Potato Head (not the real one) at that point, and hey, an overtake is an overtake. In fact that is another thing I like about this race, as whereas in triathlons I am usually the guy who turns up for fun, comes out in the top half of the swim before getting smashed by everyone on the bike and run, in a mass participation race I actually do alright and actually manage to overtake people on foot. This might seem strange as it is of course a fun run, but overtaking is a real motivator (when you are doing the taking at least!) and definitely helps with a bit of an extra speed boost. Next up on the course is the park, which involves a small hill, but more importantly the radio stand, where you get some loud music and importantly some carb drink. Whilst I am not a qualified sports nutritionist, it is one of my interests, and I like to use myself as a bit of a human guinea pig to test out different combinations during training to come out with something to at least get me through longer distance races. Here my fuelling strategy for the race had been to have an energy gel at the start, then three more spread out over 30 mins or so, with just water at the fuel stations, which had worked alright for a bit, but been based on the assumption that it would be a cold and wet race. Of course that was not to be, and with the sun out and wearing a black long-sleeved top, I was loosing fluids much faster than usual, so found myself gulping back blue Gatorade (or whatever was sponsoring the race this year, I cared not) knowing I needed all I could get for what was coming up. Yes, the final stage of the race could mean only one thing, looming in at kilometre 16 like an active volcano: The Hill. 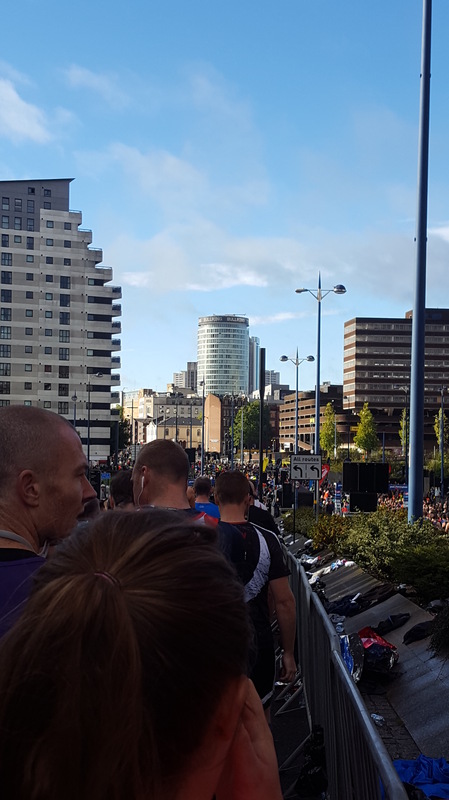 Perhaps the most famous part of the Great Birmingham Run, and described in the Channel 5 commentary by long distance legend Dave Moorcroft as ‘one of the most savage in UK athletics’, this kicks in around three-quarters of the way through the race (i.e. when you are most tired and need a bit of a hand) and goes on for pretty much the rest of the course. Observe my elevation profile above for a graphic illustration. Before I first did this race I used to wonder what all the fuss was about, having driven along the road in question many times without noticing any particular steepness, but on foot it is a whole different ball game, as I found out to my cost the first time I did the race. And the second. And indeed this time as well, as despite being fit enough to tackle the first kilometre section under the bridge (and are handed an orange segment by supporters for your troubles), it just went on and on. Despite the pain of the hill, I do have mixed emotions to hear they are going to scrap it next year in favour of a different route, as it is the run’s USP and gives those of us who conqueror it something in the way of bragging rights, so it will be interesting to see what happens next time. Still I can proudly say that for the first time ever, I did not walk at all. Sure I did that strange sort of shuffling run athletes do when they look like they have just done a Paula Radcliffe where you barely seem to be going forwards, but as far as I am concerned it was still running, and I am pretty proud of it. Needless to say the worst and hardest section of the whole race was the exact moment you go past my work office by Five Ways, at the summit of the hill where you have absolutely no energy left to even give it a wave. Or at least some sort of gesture. 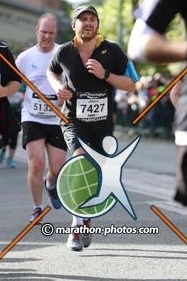 Not my best race photo… ouch! By this point I knew my hopes of a 2 hour finish were gone, having been over the 7 min/km mark towards the end of the ascent, but with the pressure now off I could at least enjoy the end, so after being given the largest ever handful of jelly babies (to the point that they overfilled my mouth and I couldn’t actually breathe) by the kind cheerleaders at the boost section for the final km, I switched to a power song on my headphones and put on the afterburners onto Broad Street and into the finish chute with a trademark final sprint over the line. My final time was 2.03 hours, agonisingly close to beating that two hour mark, but I guess still leaving something for me to aim at in future with a bit more training. On the positive side, my previous times were 2.08 in 2014 & 2.12 in 2013, so I managed to knock off a huge 5 minutes from my PB, and I could technically extrapolate my time to around 1.58 if I was to do this again next year. But I won’t be doing this race again next year, at least not this distance anyway. That reason I mentioned earlier about why I signed up for this race in the first place? 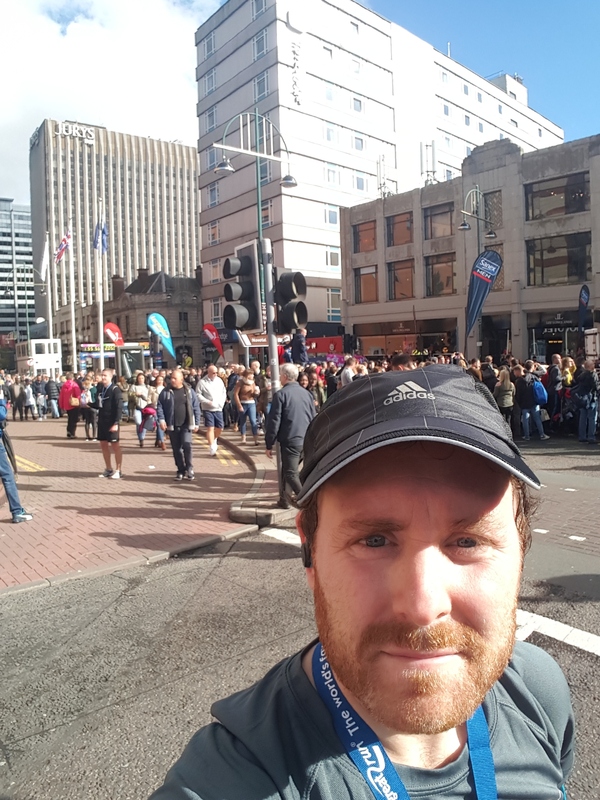 Well I am a firm believer in facing my fears, and could not turn down the opportunity to enter the first Birmingham Marathon, which is going to take place next October at the same time as the half-marathon, although parts of it will be on a brand new course. It is going to be a huge personal challenge for me, but in the end that is what this is all about, and I have to say I am pretty damn excited about running further than I ever have in my life. Better get training! 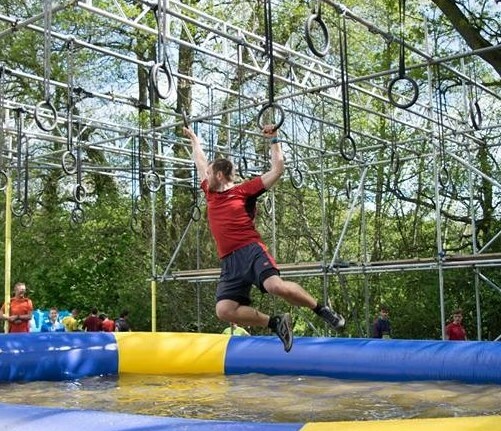 Although I have been taking part in triathlons for a while now, I will freely admit that (along with many people) until a few years ago I had no idea obstacle races even existed. I am not sure of the exact moment when they became mega-popular, but at some point they seem to have exploded! 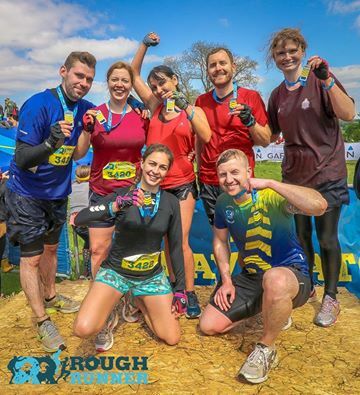 Now every weekend there seems to be tons of events all over the UK where you can run around fields, wade through mud, climb ropes, crawl under barbed wire and even brave electrocution, all in the name of challenging yourself and your body to the limit. Events such as Tough Mudder, Wolf Run and Survival of the Fittest have become arguably as big brands as Ironman, and are a lot more accessible to boot, avoiding the significant cost and training requirements of triathlons. And that is not to mention the social aspect of the races, given they tend to work really well as team events, where you can run as a pack and help each other navigate those tricky obstacles (as demonstrated in the above halfpipe). Most importantly, they have a real emphasis on the fun side of things, and while I personally enjoy some of the pain and suffering you go through in a long distance race – each to their own! 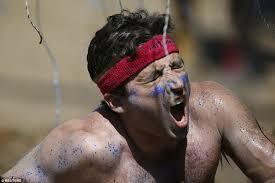 – obstacle races seem to involve a lot more laughing, either at some of the ludicrous obstacles or just at each other. As much as I fancied trying out one of these events, I had never actually got around to it, with the closest being the Colour Obstacle Rush last year, which was a bit like Park Run crossed with Fun House: a fun day but not particularly tough, the main difficulty being getting all that pain out of your hair afterwards. 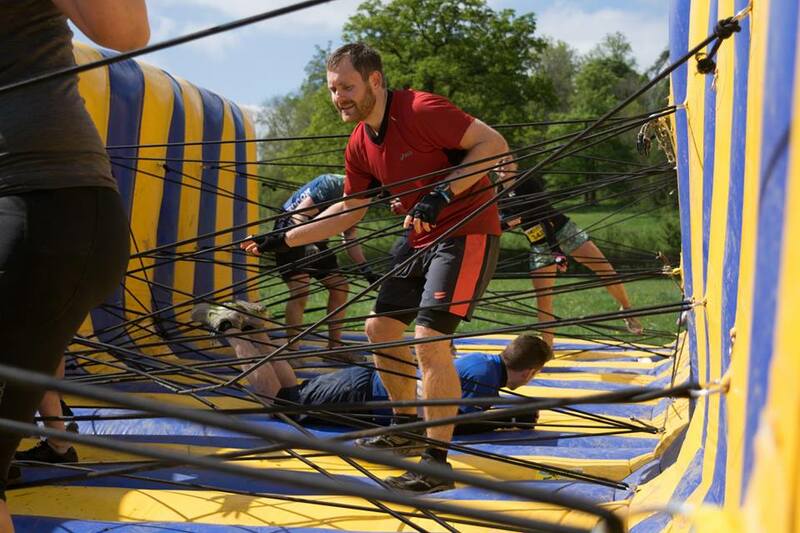 So things worked out really well when my wife and a few of her work colleagues invited me to join their team in ‘Rough Runner’, a 10km race in Oxfordshire, with obstacles based on Saturday night TV shows such as Gladiators, Takeshi’s Castle, Total Wipeout and Ninja Warrior: How could I say no?! Fast forward a few months and my team of seven found ourselves on a huge country estate in the Cotswolds, watching one of the funniest briefing videos I have ever seen, with lines like “If you fall over don’t cry about it princess, the ambulances will only come if you have lost a limb”. We were in the second wave of about 100 competitors (we were supposed to be in the first wave but got carried away taking team photos! ), which was partly planned so we could reach the obstacles before they became too caked in mud… After a brief group warm up involving lots of shouting and burpies we were off, galloping down the hill full of energy like Black Beauty. 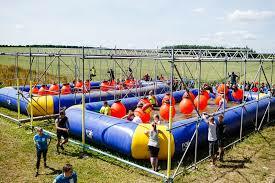 We quickly realised there was no messing around when we came across the first obstacle after about 500 yards. They had done well to hide it around a corner – something that became a theme as we negotiated the rest of the course – and it was obviously there especially for those who had been planning on avoiding the mud! This was effectively a tyre car wash, where you had to lie down and squeeze between them, all but guaranteeing you ended up face first in the muddy water on the other side. Looking back it was actually a good idea as it got the fear out the way early, and a few moments later we were back on our way with nice squelching trainers. Over the next few kilometres we encountered a whole host of nostalgia inducing stumbling blocks, ranging from classic monkey bars and spider webs to a Wipeout style Punch Wall and some sort of insane version of the Gauntlet from Gladiators… but with pigeons! 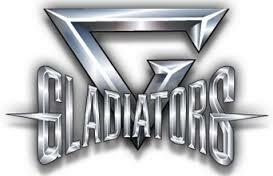 The one I was most pleased with personally was Hang Tough, a classic Gladiators event where you need to swing from ring to ring. I had never tried this before and to be honest didn’t think I had the upper body strength, but it turned out I smashed it just like Jet, and I have to say I still feel pretty chuffed to have made it. The same goes for my wife who managed a huge jump to get up the half pipe and clamber to the top. The highlight for everyone though was a huge waterslide about halfway round – a nice reward after a gruelling series of hill climbs – which although it only lasted about five seconds was a massive rush and the release we all needed. It was not all easy going though: we should have known there were going to be some toughies when we were warned to wear gloves for the race, and one particular one that seemed to knacker everyone was ‘Newton’s Cradle’, where you basically had to traverse a number a number of swinging space hoppers / buoys, using a combination of momentum and pure chance to clamber from one side to another. I managed to get away with relatively minor rope burn, but some others looked like they had been in a rope fight with an octopus. 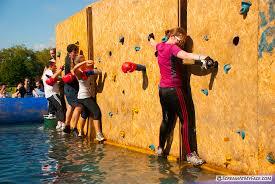 Aside from the obstacles, the course itself was pretty challenging. Although the event was not timed (I know I keep calling it a race, but that was not really the point) the 10 km course was littered with rabbit holes, nettles, and generally uneven ground just waiting to trip people up or sprain some ankles. By about kilometre 8 our team was looking a bit like the walking dead, with two people half-limping from achilles related issues, others displaying an array of bruises on any uncovered limbs, and all of us dripping wet from our latest immersion. 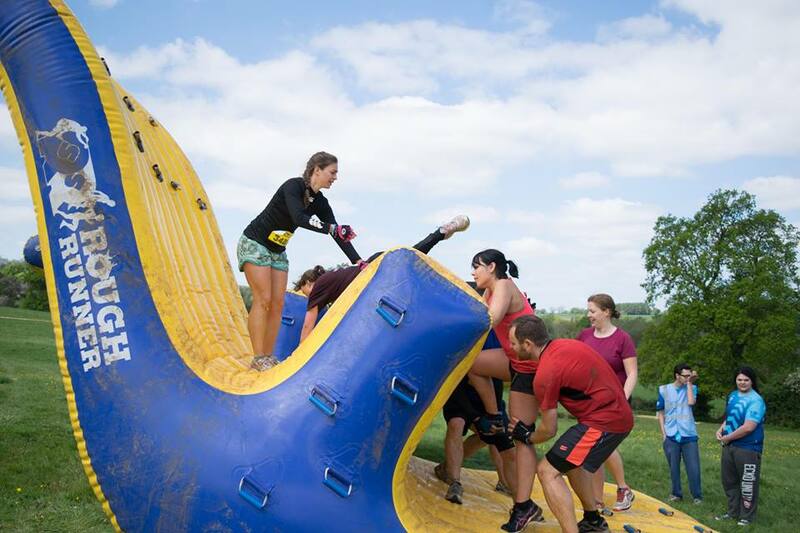 Still, this was where the team spirit really kicked in, as we approached what we knew would be the final – and one of the toughest obstacles – the Travelator! 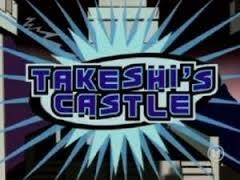 Yes, this really was every 90’s child’s fantasy, and just like in Gladiators you felt like you had gone through the mill in the Eliminator by the time you reached it. This one had four lanes: Fast, Medium, Slower, and finally a reverse one for those who had literally nothing left. Obviously I can’t say no to a challenge like this, so had to take on the fast one, and it was tricker than it looked. The pace is not an issue, it is the sudden change of pace combined with the angle, that really makes it hard. That said, after a momentary stumble where I convinced myself I was going to lose it, I managed to recover and power through to the top victorious! Moments later the rest of the team was up with me, having completed various levels of Travelator-induced difficulties depending how much they could still walk, and we had a last wave for the cameras, before a final water slide to the finish line. 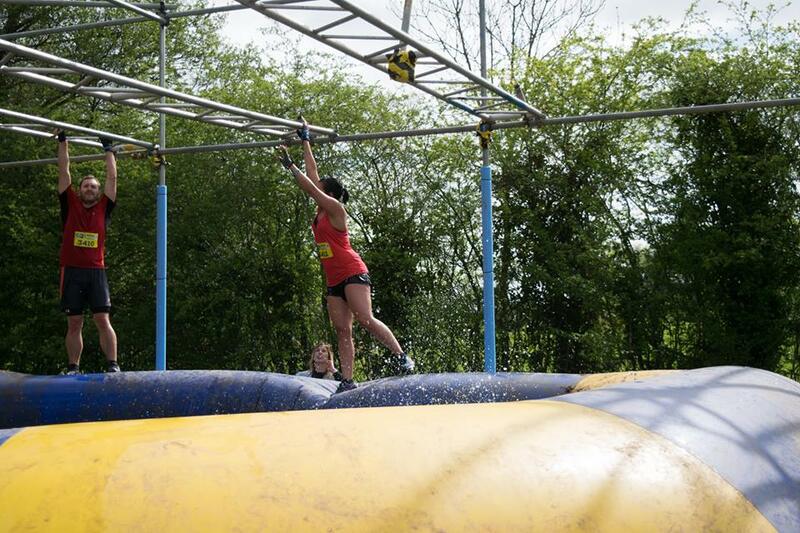 First ever obstacle race completed! Looking forward to more next year!! It has been a pretty busy start to this year with my Dryathlon (3rd year running), a new job (starting tomorrow) and of course plenty of training, which of course is not a resolution being that it is nothing new, and will not come to an end on 31st January!). I have really gone in at the deep end this week with Monday Combat, a Run on Tuesday, Wednesday Attack, Thursday Combat and Friday Spin ‘n Swim. Then a bit like Craig David I chilled at the weekend. Well on Saturday anyway, so maybe more like Walter on the Big Lebowski. But in reality this was all just a build up to the new Les Mills class launches today, some of which featured in the One Live event in Manchester last November, which feels like ages ago now. First up was RPM on Friday evening, one of the ones I did manage to do in Manchester, although perhaps as it had been first up on the day my brain seemed to have forgotten / blocked out most of it. After 4 days in a row of fairly leg intensive workouts this was not an easy ride, but as mentioned there was a great line up of music got me through it, particularly the energetic Runaway (You & I) track by Galantis near the end, which seemed very suitable for a spin class. 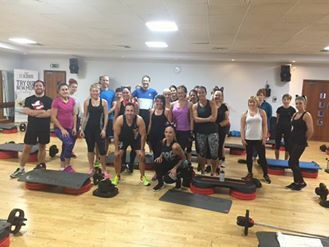 The class was packed – obviously given it was January – and I always feel a bit guilty watching the pain on the faces of of those who have made it their resolution to try some new classes and have no idea what they are getting into! It can be a bit annoying though as I have found out the hard way, in as well as there being no spaces left in the car park, my regular spin class that I have barely missed for the last 18 months is already full next week so I can’t even go myself, although as our coach pointed out it will calm down pretty soon as people start dropping out. But the main event of the week was all about today, with back-to-back launches of Body Combat, Pump and Attack! So two hours in we launched straight into the third class, Body Attack, which was a blast, helped a lot by our fantastic trainer Short Shorts (I will leave that one to your imagination) who ensured it was both knackering and camper than a row of tents. Most of the tracks here are based on circuit training / plyometrics, and from the outside may look like a strange sort of line dancing, but taught well it can be one of the most fun of all LM classes as well as great all around fitness. There was even more great music here, with a welcome return of the Runaway track (they must have had some sort of bulk deal from Galantis to feature that often) which again worked really well in the ‘run around the room in circles’ track. I forgot to mention earlier that as with all of our club launches we had a theme for the weekend, and this time around it was luminous – very appropriate at this time of year. This meant everyone had glow sticks, although I managed to take it one further with my luminescent yellow under armour top. I thought it looked great, although during attack they turned the main lights off and had the disco beams going, and the lasers suddenly made me glow like Ross’s teeth in that episode of Friends with the black light! All in all it was just under 3 hours training, and (according to my wife’s Fitbit) around 2000 calories. We were pretty much the only ones to make all three classes which was also a great personal achievement, and I think a decent enough excuse for a bacon & egg brunch and snooze on the sofa this afternoon to write up this blog! Coming up to two years of writing this blog I have surprised myself a bit that I am still going. I initially started at the beginning of last year as a way of helping me track my progress and to motivate myself through the Chile Challenge and it served its purpose pretty well, giving me a way of sharing various training and race pictures, and somewhere to dump those random thoughts you accumulate during long sessions. At the end of last year I thought about closing it down: after all the challenge was complete, the sponsorship money collected, and my body well and truly knackered! But then something else came up which would make 2015 even bigger than before – Ironman! My other big race was of course Ironman Staffs (7.17.12), a fantastic event from start to finish, with the most amazing feeling crossing the finish line. It really was a great weekend, maybe even once in a lifetime, but one all triathletes should experience at some stage in their career. 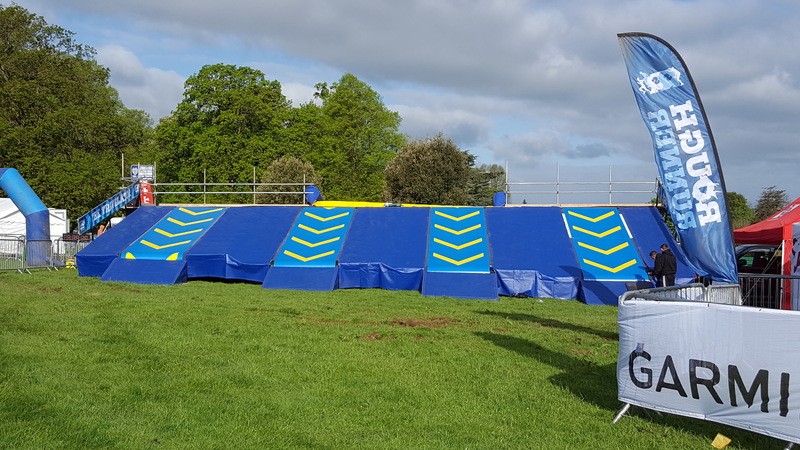 It was not all swim-bike-run though, as this year also marked my first ever obstacle race – the Colour Obstacle Rush in Sheffield – wit my wife and various other family and friends. I have no idea what the time was as my old GPS died part way through, possibly asphyxiated by powered paint, but this was never about how quickly you could complete it; in fact at times we actually slowed down to make the experience last longer as we traversed bouncy castle mazes and half-heartedly dodged each others paint grenades! Aside from racing, I managed to really ‘get into’ fitness classes, something I had actually been doing for a while, but this was different. Along with my wife, who became equally obsessed, we started going to 3, 4 and even 5 classes per week, including RPM, Body Attack, Combat, Pump to name but a few. 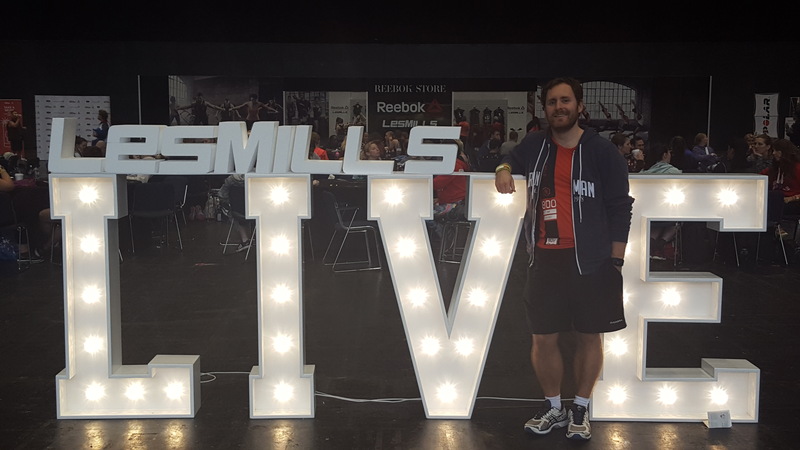 The culmination was our trip to Manchester for the One Live event which involved 6 different classes in a 9 hour or so day, the closest I have got to triathlon endurance indoors! After all that, what do we have to look forward to in 2016? Well the big race is already booked in the calendar, the Isoman. 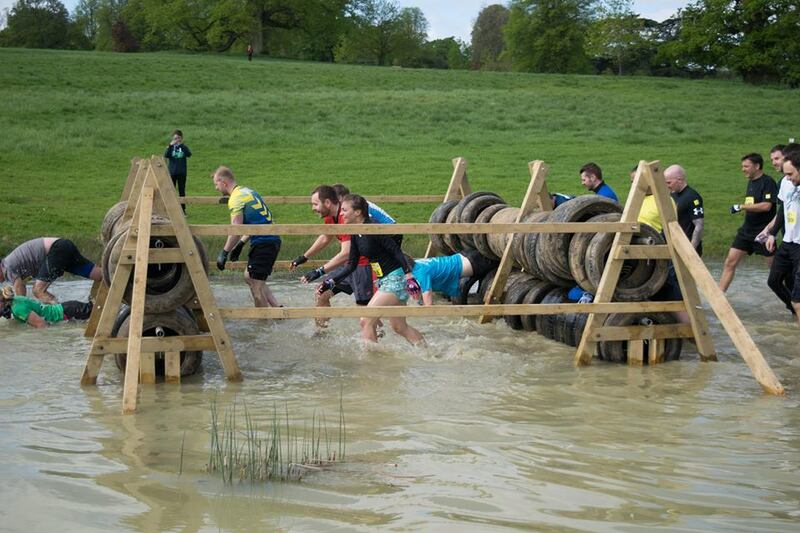 More on this to follow, but let’s start by saying it begins with a 3.5 mile swim which is really going to push those boundaries… The obstacle races will also continue, with the Colour Rush back in the diary, a new Rough Runner race to kick the season off, and on the indoor side there will be plenty of new classes to look forward to. So I guess that returns me to my first question of whether to continue writing this blog, and with all this to look forward to the answer is going to have to be yes!